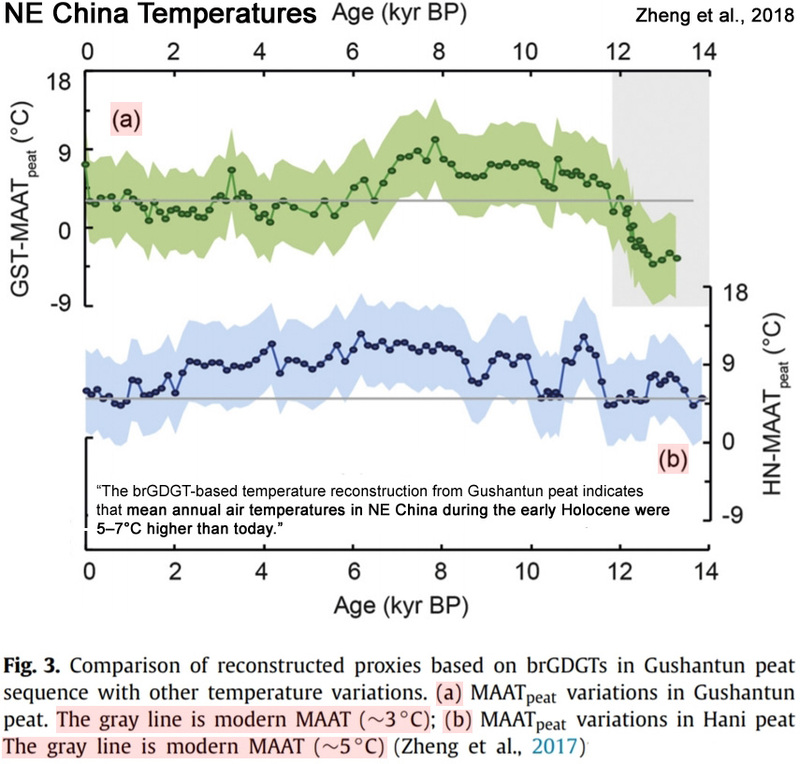 Even though CO2 concentrations hovered well below 300 ppm throughout most of the Holocene, newly published paleoclimate reconstructions affirm that today’s surface temperatures are only slightly warmer (if at all) than the coldest periods of the last 10,000 years. 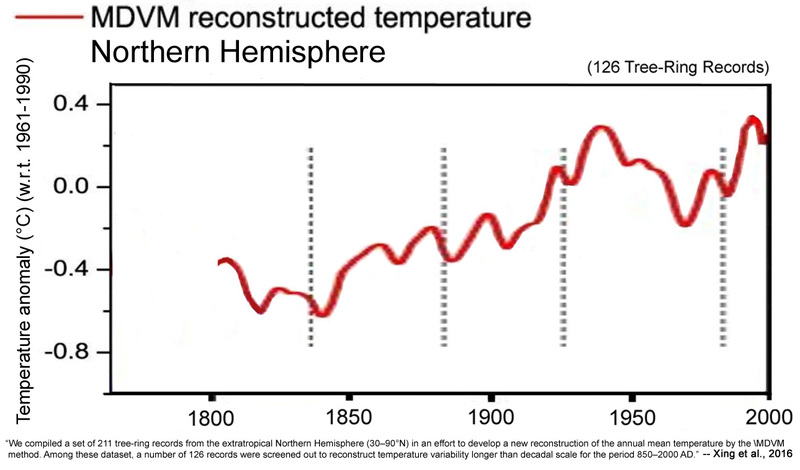 This contradicts the perspective that temperatures rise in concert with CO2 concentrations. 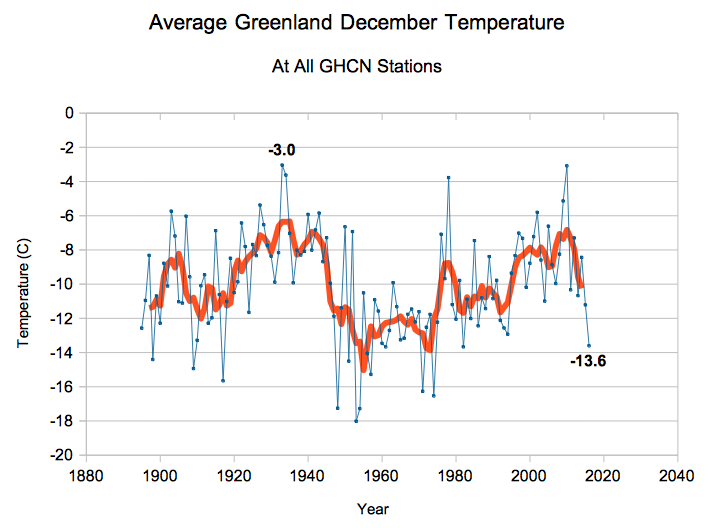 1) do you think your cherry-picked locations are a sufficiently representing the global temperature record? 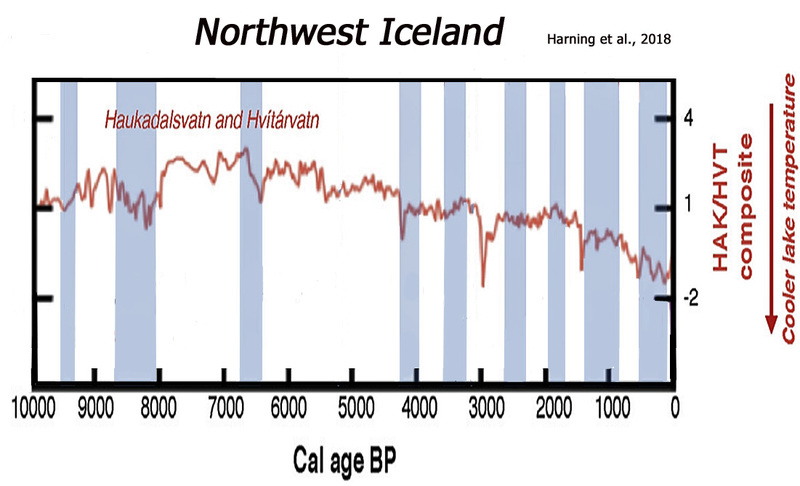 2) I’m asking because the usual reconstructions for the Holocene don’t vary by this much. Or do you see this differently? 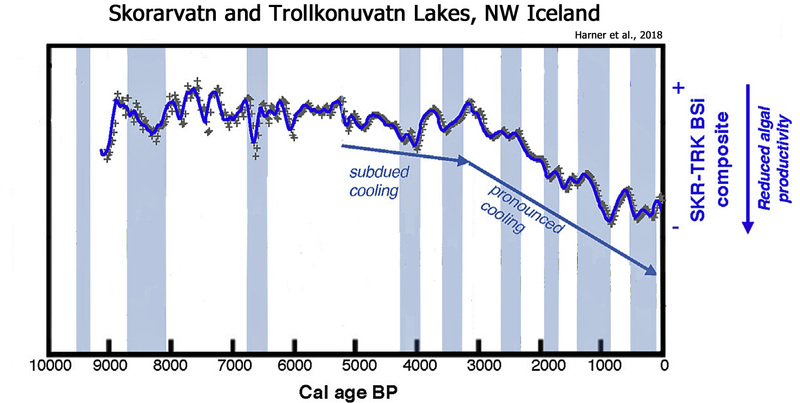 This contradicts the perspective that temperatures rise in concert with CO2 concentrations. 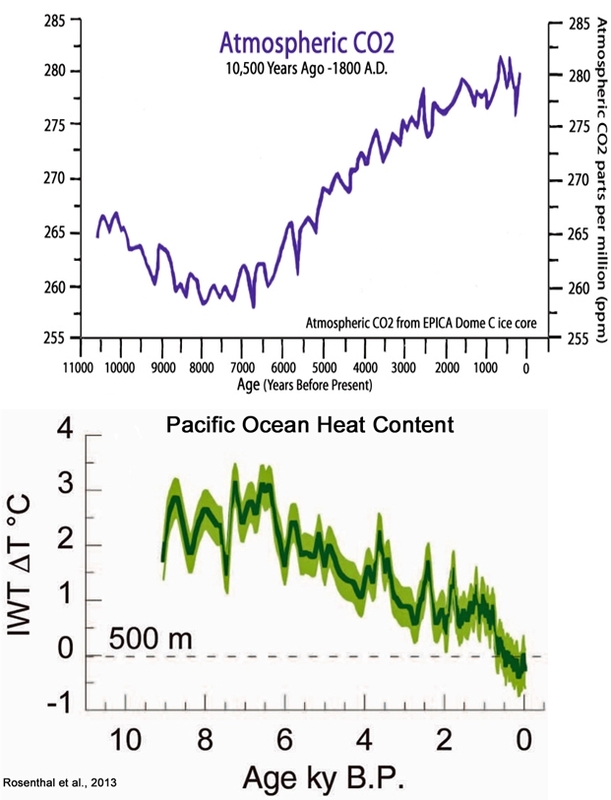 When posted together with that graph … you are basically repeating your demonstration, that you have no clue how CO2 and temperature are connected. Still on this trip of denying that it’s basic physics? And by it I mean the sulubility of CO2 in water in relation to temperature. 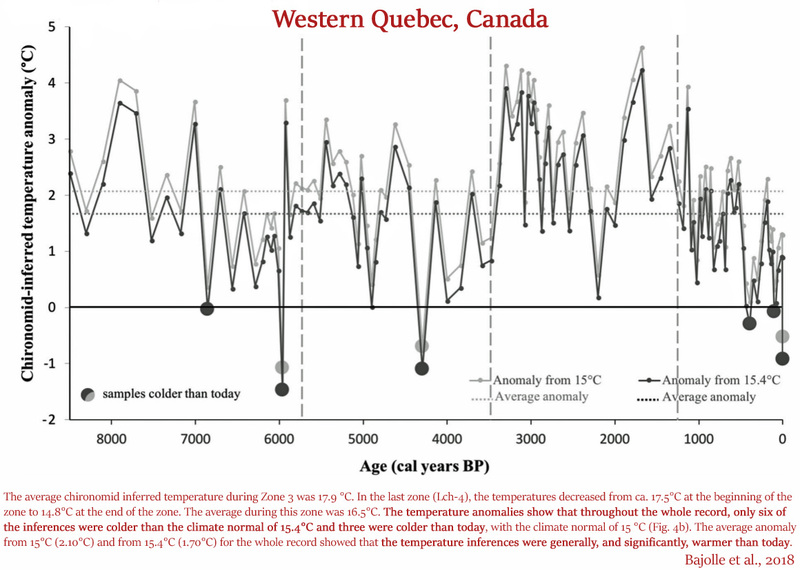 In essence: I call BS on your claim that “newly published paleoclimate reconstructions affirm that today’s surface temperatures are only slightly warmer (if at all) than the coldest periods of the last 10,000 years.” Nearly all global reconstructions joined with the measured temperature increase in the instrumental record show that it’s at least as warm today as in the warmest past periods of the Holocene. 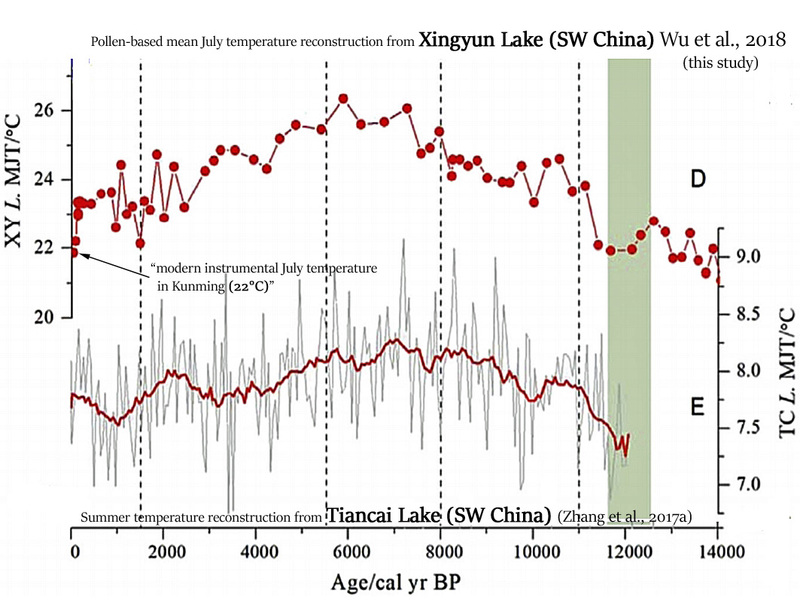 …from all over the world that look a lot like these 10 reconstructions (much colder today than during the Early- and Mid-Holocene), or that show no unusual warmth in the modern era relative to the last several millennia, or even relative to the Little Ice Age (the coldest period of the last 10,000 years), then no, I’m not impressed about your “calling BS” here. I am not looking to impress you. I am just informing you that your usual cherry-picking is not the same as a global reconstruction and many of those global ones do exist. So why not look at them instead? Because they don’t agree with your imagined world? You aren’t informing anyone of anything. You DO NOT have that capability. You are just HIDING behind your manifest ignorance and DENIAL of the science so that your brain-hosed mind doesn’t have to face any actually REALITY. Cherry-picked from basically EVERY part of the world. Your desperate DENAIL of science is getting quite hilarious. Really seb.. you have NOTHING. Stop being a CLIMATE CHANGE DENIER, seb. I call BS on your comments, seb..
.. because that is all they are. 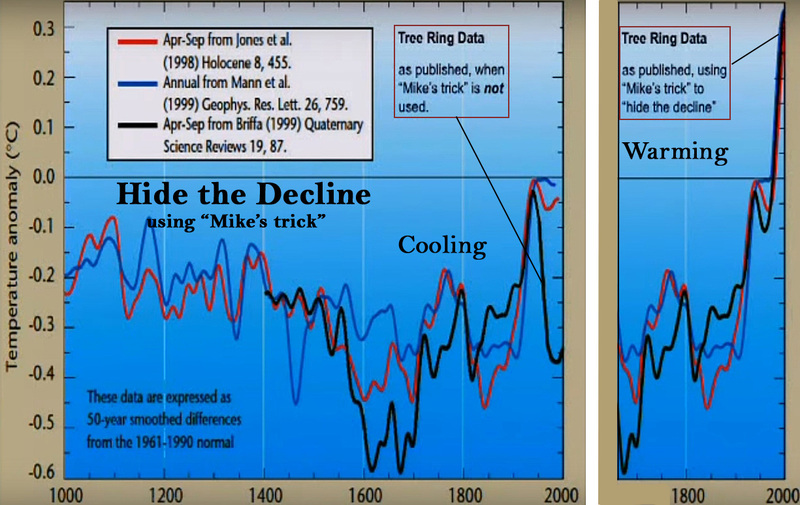 There is no causal link from atmospheric CO2 to temperature. YOU HAVE ZERO EVIDENCE that there is. You are CLUELESS, in every respect. 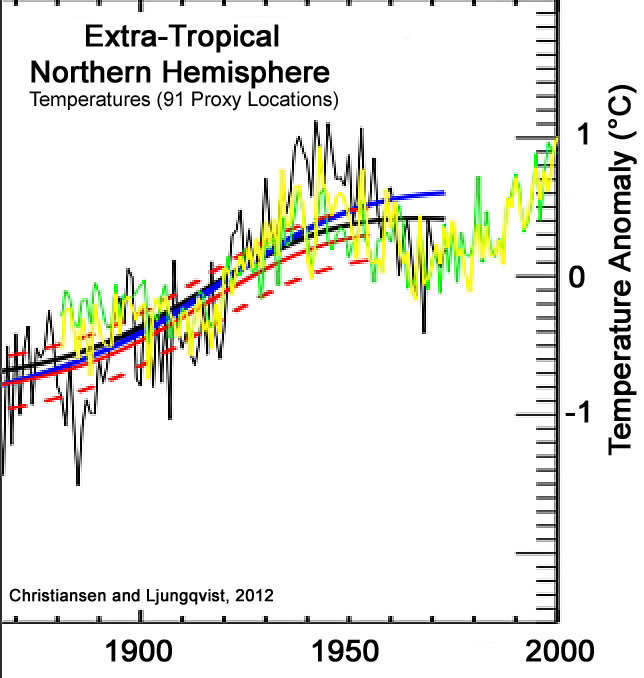 Global temperatures are only just above those of the LIA. 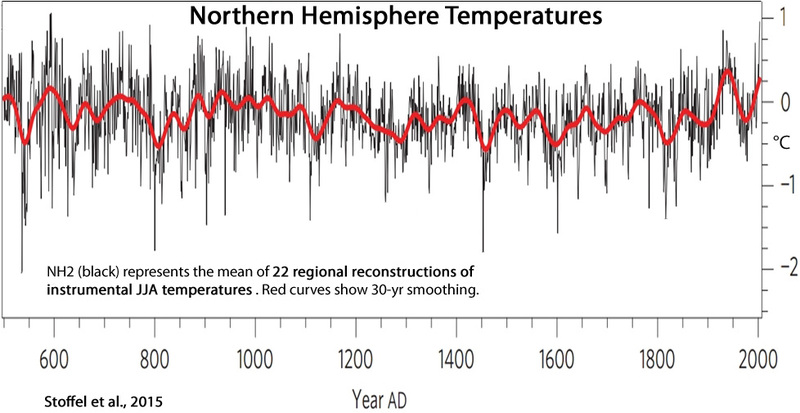 Despite ALL the data from all over the world..
.. you are still in a state of manic CLIMATE CHANGE DENIAL. You KNOW there is zero evidence of CO2 causing warming. Sorry basic comprehension is beyond you. If you don’t understand basic science.. why do you keep commenting and making an abject fool of yourself ? Only slight warming in the last 40 years has been from two El Ninos ocean releases. Do you have ANY EVIDENCE AT ALL that they were caused by human emissions? 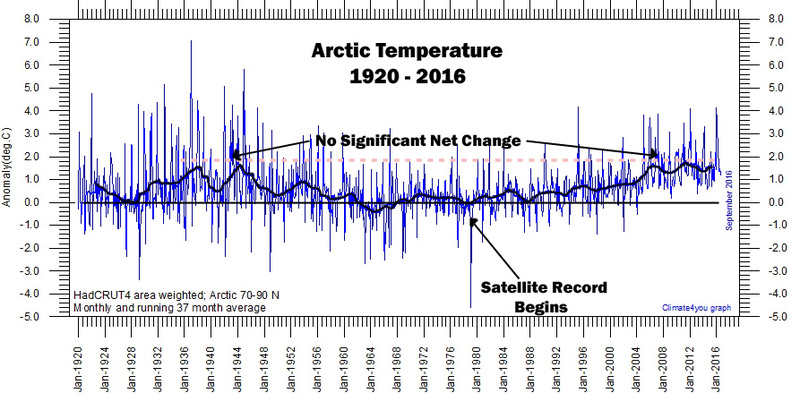 Apart from the slight beneficial warming since the coldest period in 10,000 years, in what way has the global climate changed? .. but no expectations, except that you will post yet another evidence free, evasion/distraction rant to avoid answering simple questions with REAL EVIDENCE. 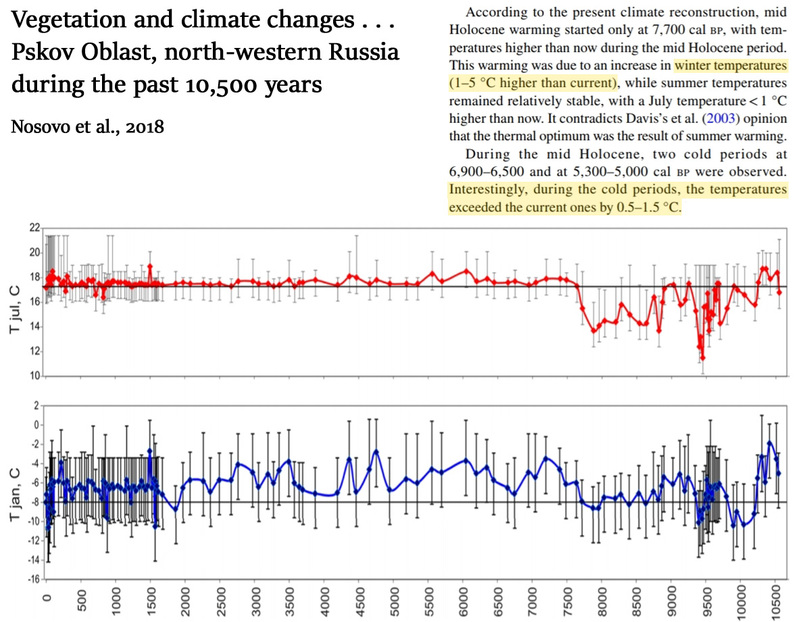 The world is still very much in a cold period of this interglacial, and unfortunately, looks like dropping back down, rather than continuing the slight, but highly beneficial natural warming that we have had. Do you have an obsession with “reconstructions joined with the measured…”? I can only assume you are attempting to paraphrase the visual results presented by Mann et al. some two decades ago, or perhaps Marcott & Shakun from five years ago. 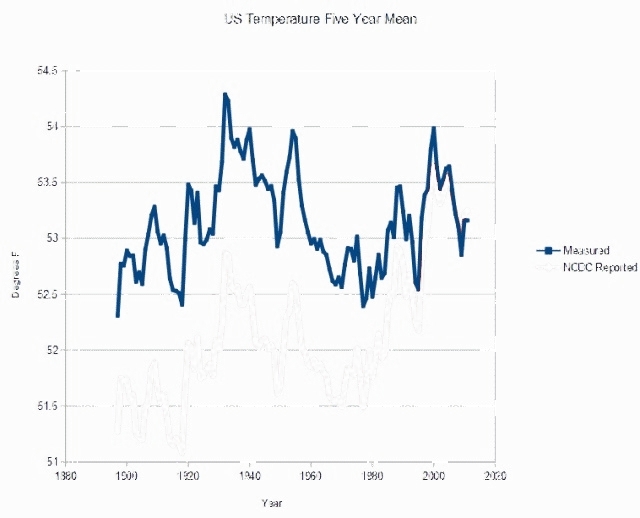 But if one looks ONLY at proxies, one discovers rather quickly that the modern temperature records diverge from the proxy record over the past century. 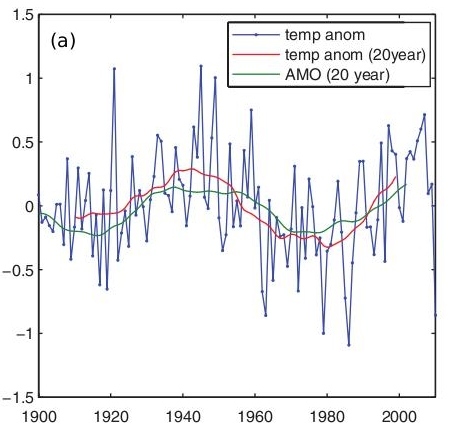 This suggests that the proxies do not in fact correlate with the modern efforts to calculate a global mean surface temperature anomaly. How would you suggest squaring this circle? 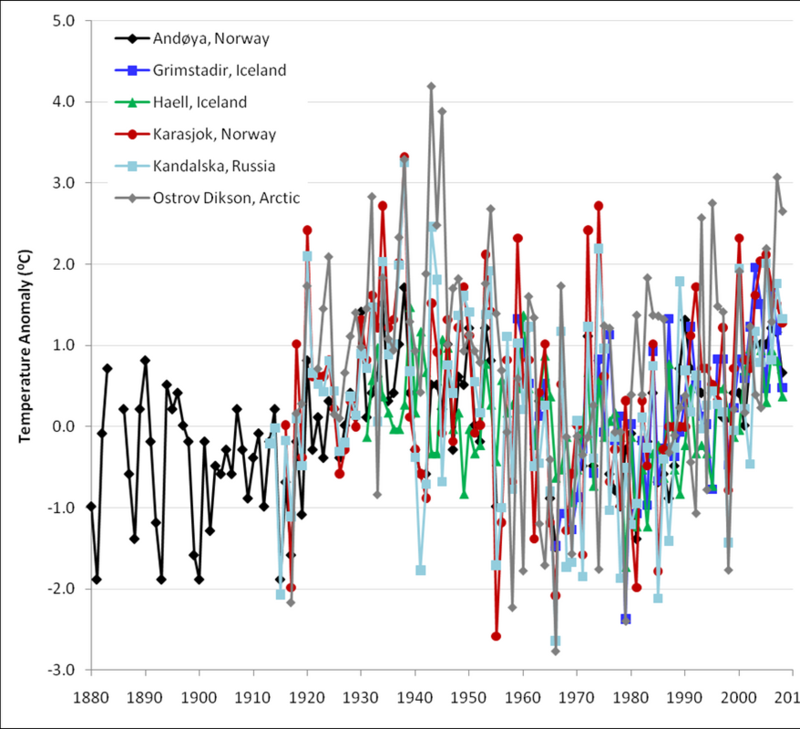 Northern Hemisphere proxy reconstructions show the same thing – cooling after the 1940s and a warming trend in the 1970s-2000s that matches or nearly matches the 1920s-1940s warming. 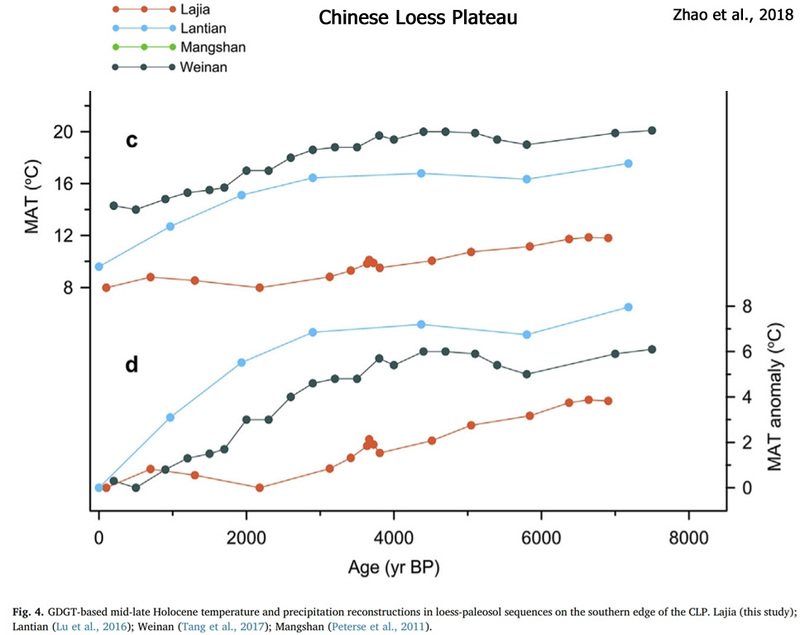 What Marcott has produced for us is a climatic history of the Holocene based upon tree-ring proxies. 1. The proxy data in the accompanying Excel file show no dramatic increase in the 20th century. This can easily be checked simply by plotting the supplied data. 2. Figures S5 and S6 show no recent upturn at all. 3. The Phd thesis of the first author uses the same data sets and plots similar graphs, but with no trace of any sharp increase. This earlier contradictory work is not cited in the paper. Why choose a proxy record that completely hides the LIA decline? 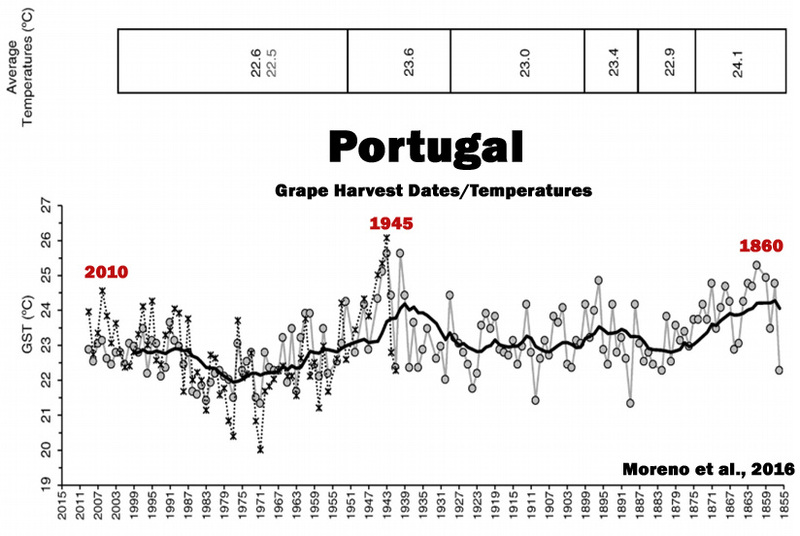 Ehm no … that graph doesn’t show this and you should know that if you read the paper. 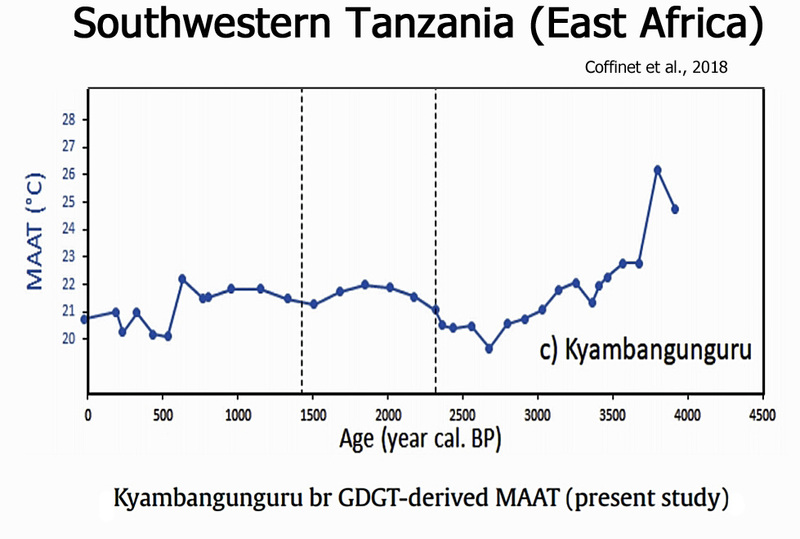 You keep bringing these graphs up as if global reconstructions would not exist at all. Why? You keep making EMPTY comments as though you actually had evidence. 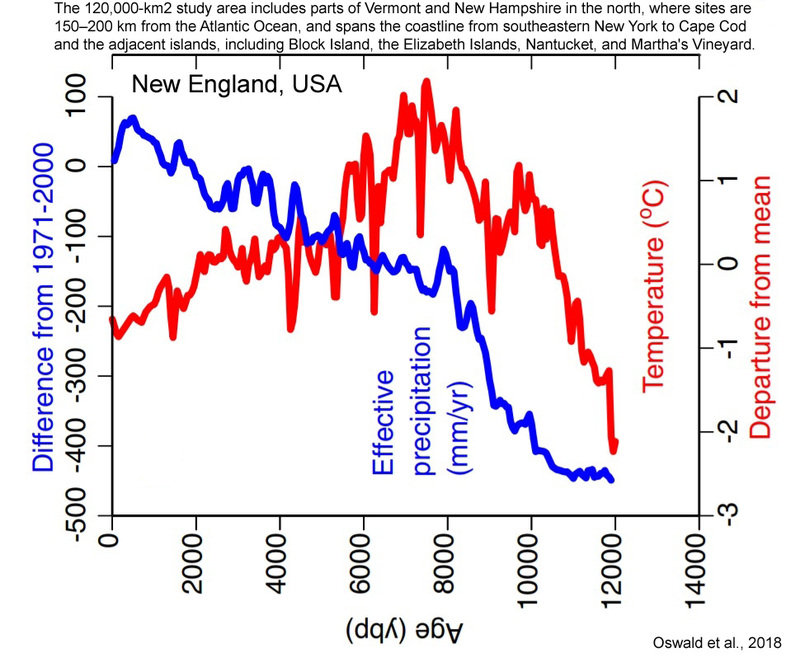 All REAL data shows NH at a similar temperature now as I around the 1940s. They also show the late 1970s as the coldest period out side of the climb out of the LIA. Stop your data DENIAL, seb. It makes you look like NOTHING but a mindless troll. All real data …. riiiiiiiight. Stop cherry picking and construction a world that doesn’t exist in reality with physics that don’t work in reality. Which ding bat claims that perspective Seb? On a different note Seb I strongly suggest you indulge reading the Quantum Physics 101 referred to in the 2nd last post above. 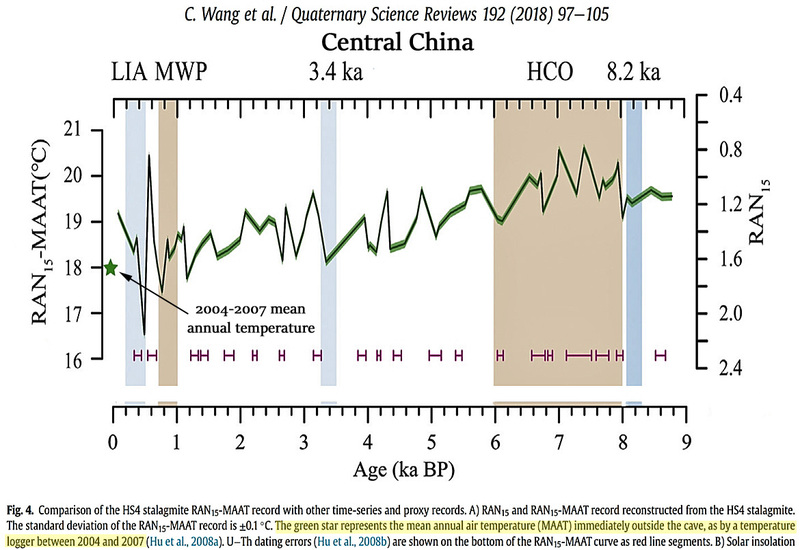 The technical article also answers Malcolm Hughes 2009 email that said “… whilst CO2 is a good candidate to explain it (global warming) It is far from proven” The article above shows the proof that it is not a candidate at all.